Carnival masks are the hallmark of il Carnevale di Venezia. Venice's Carnival began in the 11th Century, and the wearing of masks and costumes was well established by 1436, when maskmakers or mascareri were officially recognized with their own guild. Masks virtually disappeared--along with Carnevale--when Napoleon's troops brought an end to the Venetian Republic in 1797. However, they've staged a spectacular comeback since a group of former Academy of Fine Arts students opened Venice's first modern mask shop in 1978. Commedia dell'Arte masks are based on traditional characters like Harlequin and Pierrot. Fantasy masks are figments of the maskmaker's imagination, although they may be inspired by historical designs. 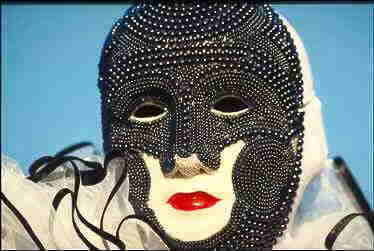 ABOVE: Beaded mask, using glass beads from the island of Murano. Elisabeth Vedrenne, author of Living in Venice, reports that the Baroness Nella Lopez y Rojo is the only remaining practitioner of this craft. Today's Venetian masks serve two functions: as vehicles for self-expression and self-display during Carnevale, and as souvenirs or craft objects to take home as souvenirs of a Venetian trip. Masks are easy to obtain in Venice. Street vendors sell them (especially at Carnival time), and you can buy anything from mass-produced paper or ceramic miniatures from China to handcrafted papier-mache and leather masks by skilled local artisans. This shop is near the SS Giovanni e Paolo church, inland from the Ospedale vaporetto station. It's one of the oldest maskmaking studios in Venice, and its owner comes from a family of puppetmakers. 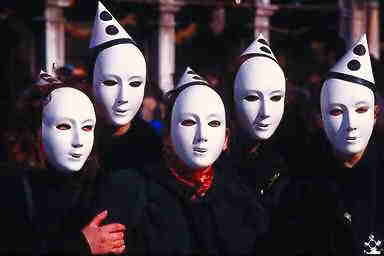 See page 3 for a link to a Web photo page that shows masks being made here. Also visit the Web site of Tragicomica, a highly-regarded costumer and maskmaker. This three-page article offers historical background, practical information, and Carnival photos. It also has links to official and unofficial Carnival Web sites. Plan your trip to the Carnevale di Venezia with this calendar. This remarkable large-format, 272-page book has 210 color photos and 30 profiles of artisans who use traditional techniques to make a variety of crafts--including carnival masks. Frantisek Staud serves up a Carnevale photo collection.